Jennifer and David Patruno are our fearless and dedicated camp directors! Having a fun, positive, and motivating camp is as important to them as great running instruction. Both Jennifer and David can be reached at aimhighrc@aol.com. 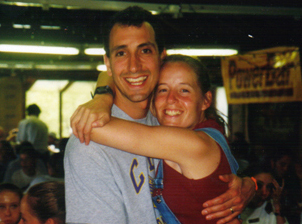 Dave and Jen met in 1989 at, of all places, a running camp. Their love of running kept them in contact during the next eight years. In 1997 they started Aim High and got married the following year on July 10, 1998. They have two sons, Jonathan (2006) and Christopher (2007). They reside in Baldwinsville, NY. In 1990, Jennifer won the National Scholastic Indoor Track Championship in the mile while running for Sidney High School (Sidney, NY). She’s a four-time New York State champion (2-XC, 2-track). From Sidney she went on to Wake Forest University where she studied Health and Sports Science (B.S. ’95). While at Wake she placed fourth in the 1500 at the 1995 NCAA Division I Outdoor Track Championships. She was a two-time All-American in track. She has personal bests of 2:08.7 (800-meters) and 4:16.75 (1500-meters). Post-collegiately Jennifer competed for the Reebok Enclave then the Syracuse Chargers Track Club. She led the Chargers to the USATF Eastern Regional Cross Country Championships in 1999. Jennifer is a New York State certified teacher in Chemistry, Biology and Health. She also has a master’s degree in health from Cortland State. She taught for five years - one year at Vernon-Verona- Sherrill teaching seventh grade science and four years as a chemistry teacher at Cicero-North Syracuse High School. Presently, besides being camp director for Aim High Running Camp, she is a mommy to Jonathan and Christopher. David was the Competitive Teams Coordinator for the Syracuse Chargers Track Club from 1997-2006. Under his direction the Chargers won 16 team championships and broke club records 32 times. Four Syracuse Chargers qualified and competed in the 2000 U.S. Olympic Trials – two in the marathon and two in track. He manages, advises and works with athletes competing at local and national levels. For seven years he was the Invited Athlete Director for the Syracuse Festival of Races. In 2002 the elite athlete field he assembled ran so fast it was ranked as the second fastest 5K in the world that year. David attended Le Moyne College where he received his B.S. in Business Administration (’88). He led the Dolphins to the 1986 Mid-East Conference Cross Country Championship. He has personal bests of 15:31 (5K) and 31:54 (10K). He loves working with junior high and high school age distance runners in the areas of form work, goal setting, training plans, and attitude. David is employed by Patruno Electric where he is in charge of business operations.